The BEST Water Therapy Without Getting Wet! Heat: Soothes as it increases circulation and relaxes strained muscles. Flotation: Relaxes your body and calms your mind making you perfectly receptive to the deep, penetrating action of the swirling jets of water. Massage: Hydromassage provides a non-mechanical type of massage that is far more thorough than hand massage. It penetrates deeper into muscle tissues than one could imagine water would do. As tension is released you feel better physically, emotionally and mentally. When your body relaxes, your mind relaxes as well. Massage action is powered by a powerful Jacuzzi brand motor that pumps the water through strong whirly bird type jets. These jets act like powerful sprinklers by caressing the entire contact surface of the body with the therapeutic power of water at its best. NOTE: Tables are custom made to order and are not returnable unless defective or with authorization for return from our customer service. Authorized returns will incur a restocking fee of 20% and return freight charges. Allow 3-4 weeks delivery time for any of the hydromassage tables. 2 hp Sta-Rite motor/pump is the most efficient and best performing in the industry and exclusive to this model. With awesome power, this commercial model also has a cooling fan to prevent overheating with continuous usage. Normal Maintenance: occasional topping off of evaporated water & addition of algicide/lubricant every 6 months. 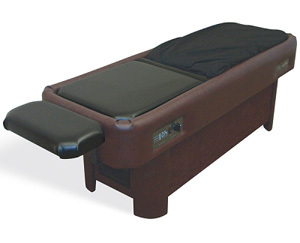 LEAD TIME: These fine tables are custom made to order so please allow approximately 3-4 weeks for delivery for any of the hydromassage tables. Ships fully assembled via freight carrier. (Alaska, Hawaii, Canada or overseas deliveries would be shipped broken down and require assembly. There will also be an upcharge for shipping to these areas). WARRANTY: One year warranty on parts and/or manufacturer defects. RETURNS: Tables are custom made to order and are non returnable unless found defective. Any return must be pre-authorized by first contacting Back Be Nimble customer service. Authorized returns will incur a restocking fee of 20% plus applicable return freight charges. Full Body Dry Hydrotherapy - RejuvaWave Hydromassage Tables | FB200 - Rejuva Wave offers full body hydro-massage options, exemplifying the essence of therapeutic hydrotherapy as the elite model for salons, spas and clinics. Hydromassage Tables and Dry Hydro-Therapy Tables | Sidmar S10 Pro - Lie down on a bed of soothing hydrotherapy without getting wet, knowing that Sidmar offers the most reliable and affordable hydromassage tables.